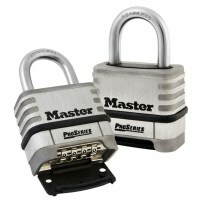 A well-protected and reliable choice of padlock designed for commercial and industrial applications. The Master Lock 1174D Combination Padlock is a hard-wearing, durable lock, designed for commercial and industrial applications. The product is made from corrosion resistant stainless steel, with a hardened steel open shackle, which also has a shackle seal and dial dust cover to protect its components. 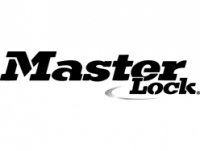 With a deadlocking mechanism to help resist prying and shimmying lock attacks, the Master Lock Combination Padlock is a well-protected, reliable choice. It is a simple padlock to operate as It features a resettable 4 digit combination, with no special reset tool required to manage it. There are 10,000 potential combinations available to use.